They’ve become such a part of the urban landscape that we hardly pay them attention any longer: the homeless, the crazies, the people on the fringes of society. We’ve become inured to their presence; we don’t look too closely, because to do that, to acknowledge their existence is to acknowledge that the holes in the social safety net are getting bigger all the time, and that there, but for the grace of God, go you and I. But what if some of those who dwell on the edges of civilization aren’t quite what they seem? What if some of the outcasts were something more dangerous than we imagine, something to be feared not because they represent the failure of our culture to help its weakest and most vulnerable members, but because they aren’t just drop-outs from society, but something else entirely? There is an old Inuit legend that warns of encountering an Inuit walking alone, far from any village. It is said the Inuit is not an Inuit, and to approach him is to invite death. This is the tale that Nomads brings into a 20th century urban landscape, expanding the Inuit tale to apply to a portion of the disenfranchised we see day in and day out in every major city in America. 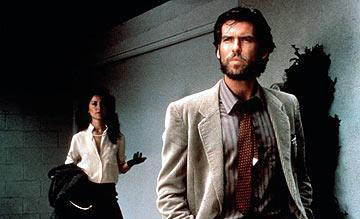 The story follows two people: Jean Claude Pommier, a French anthropologist played by the gorgeous Pierce Brosnan, and Dr. Flax, played by the equally-gorgeous Lesley-Anne Down. The story begins when Pommier is brought into the ER of the hospital where Dr. Flax works; he is raving and incredibly strong, and the paramedics believe he is on drugs, possibly PCP. As Flax tries to treat Pommier, he suddenly grabs her, whispers something in her ear, bites her and then promptly dies. We soon learn that during this odd incident, Pommier somehow transmitted the memories of his last few days of life to Dr. Flax, and the tale from this point is told in a combination of flashback to Pommier and the present time of Dr. Flax, with Flax following Pommier’s trail and seeing what he saw after he started paying too much attention to some of those who dwell on society’s edge. Nomads weaves not only a unique tale, but also tells it in a novel fashion. And although the movie takes place in two time-frames almost simultaneously, after the first few scenes, it’s not at all difficult to follow the plot and tell when the film is in flashback mode and when it’s returned to the present. As Dr. Flax sees what Pommier saw, the danger for her, and for Pommier’s widow, grows, leading to a denouement that is both satisfying and chilling at the same time. Nomads is engrossing from start to finish, and its 91 minutes just flies by. In this age of CGI everything, Nomads manages to tell a gripping tale with a minimum of effects and gore, but it is not lacking in action. Instead, it holds the viewer’s attention the old-fashioned way: by telling a good story. Something that happens not nearly often enough these days, but that is sorely needed in this age of ever-bigger, louder, more-is-never-enough bloated blockbusters.